At the beginning of 2014, the conventional wisdom called for investors to sell utility stocks–remarkably poor advice, given what has transpired. The Federal Reserve’s efforts to normalize monetary policy would drive up interest rates, sending the prices of bonds and utility stocks tumbling. As in Germany, widespread adoption of rooftop solar would erode US utilities’ sales, creating a death spiral of rising costs, plunging earnings and eventual bankruptcies. But these fear-mongering predictions haven’t come to fruition. Although the Federal Reserve continues to scale back its bond purchases, the yield on the 10-year Treasury note has barely budged from its range of 2.7 percent to 2.8 percent. Meanwhile, the yield spread between the 10-year US Treasury note and corporate bonds has shrunk considerably, as fears of economic relapse have waned and companies have strengthened their balance sheets. 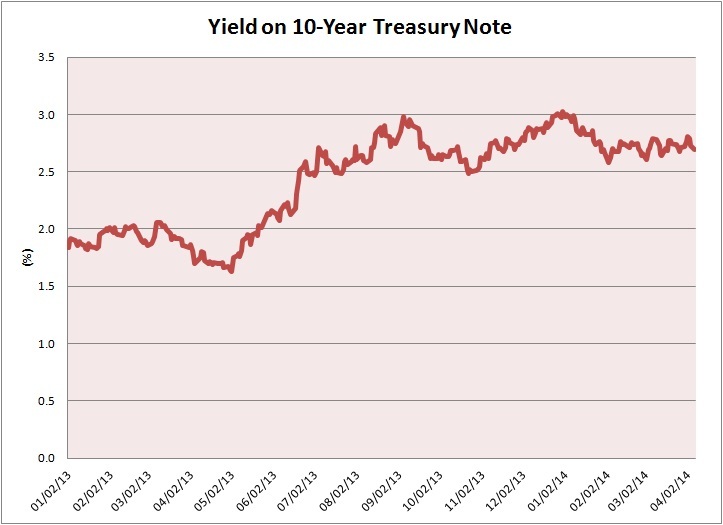 In this environment, utilities can borrow money at interest rates near generational lows. And the Dow Jones Utilities Average’s 12.7 percent gain in 2013–a year when the yield on the benchmark 10-year Treasury note surged by 72.3 percent–should disabuse anyone of the notion that utility stocks are bond substitutes. Investors worried about stocks in a death spiral should steer clear of SolarCity Corp (NSDQ: SCTY). Although the would-be utility killer’s model of distributed rooftop solar panels has generated impressive sales growth, the company’s losses and debt have climbed with each successive quarter. SolarCity also continues to borrow against future revenue via securitizations. Shares of SolarCity have given up almost one-third of their value since hitting their high-water mark on Feb. 26, 2014. Nevertheless, the stock still trades at a stratospheric multiple of 29 times sales. Delving into the returns posted by the securities in the Dow Jones Utilities Average reveals that these 15 names turned in an uneven performance. Shares of Exelon Corp (NYSE: EXC), for example, have posted a whopping 27.3 percent gain this year, while AES Corp (NYSE: AES) and Consolidated Edison (NYSE: ED) are still underwater after you factor in dividends. Last year was also a study in contrasts: Shares of AES topped the charts with a 37.3 percent gain in 2013, while FirstEnergy Corp (NYSE: FE) suffered a 16.5 percent loss. Over the period covered in my table, American Electric Power’s (NYSE: AEP) stock has turned in the most consistent performance, delivering a 14.2 percent gain in 2013 and a 9.9 percent return thus far in 2014. Two factors account for the uneven returns posted by the underlying securities in the Dow Jones Utilities Average. Factor No. 1: Although all 15 members of the venerable index participate in the energy business and deliver essential services, their business models–and potential risks–vary widely. Factor No. 2: This diversity leads to meaningful differentiation in terms of earnings and dividend growth, which increasingly hinge on a company’s unique business mix and geographic footprint. This divergence in part reflects the patchwork deregulation of US electricity and natural-gas distribution in the 1990s. More than two-thirds of the states stuck with their regulated monopolies; the rest kept the transmission and pipeline sides of the business as regulated monopolies, but created unregulated markets for generation and marketing. Over the subsequent decades, regulated businesses have delivered steady returns in most markets. However, generation and marketing have endured some wild ups and downs, starting with the fallout from Enron’s implosion in late 2001. The aftermath of this disaster left about two dozen power and gas companies either in Chapter 11 or on the brink of bankruptcy. The Result: An industry-wide retrenchment, with most companies shedding their unregulated businesses and reducing their debt burdens. The sector then redirected capital expenditures toward growing the rate base of their regulated franchises. Over the past 20 years, the majority of the names in the Dow Jones Utilities average have shifted their business mix in this direction. And the process continues. Within the index, Consolidated Edison and CenterPoint Energy (NYSE: CNP) derive all their revenue from either transmission wires or natural-gas distribution pipelines; neither outfit owns interests in a power plant. By the same token, NiSource (NYSE: NI), PG&E Corp (NYSE: PCG) and Southern Company (NYSE: SO) sell the preponderance of the electricity generated by their power plants into regulated markets. Last week, Edison International (NYSE: EIX) became a pure-play utility, closing the sale of its bankrupt Edison Mission Energy unit to NRG Energy (NYSE: NRG), which on March 11 also announced the purchase of Dominion Resources’ (NYSE: D) retail energy business. Subscribers to Conrad’s Utility Investor can read my take on these deals in an Alert issued on March 19, 2014. Not a subscriber? Learn more about the publication’s features and sign up for a risk-free trial. Meanwhile, AES and Duke Energy Corp (NYSE: DUK) are in the process of selling their merchant power plants in Ohio. Williams Companies (NYSE: WMB) generates its cash flow from an extensive portfolio of midstream infrastructure that handles crude oil, natural gas and natural gas liquids. The firm’s primary assets consist of general- and limited-partner interests in Williams Partners LP (NYSE: WPZ) and Access Midstream Partners LP (NYSE: ACMP), which provides gas-gathering services in the Marcellus Shale and other basins. Exelon, on the other hand, generates almost half its earnings by selling electricity in unregulated wholesale markets. FirstEnergy and Public Service Enterprise Group (NYSE: PEG) also have substantial exposure to unregulated business lines. Weakness in the wholesale power market forced Exelon to slash its dividend by 41 percent in February 2013, while FirstEnergy announced a 34.5 percent reduction to its quarterly payout in January 2014. NextEra Energy (NYSE: NEE) also generates much of its earnings in unregulated markets, though its focus on renewable energy means customers have booked much of its capacity under favorable long-term contracts. 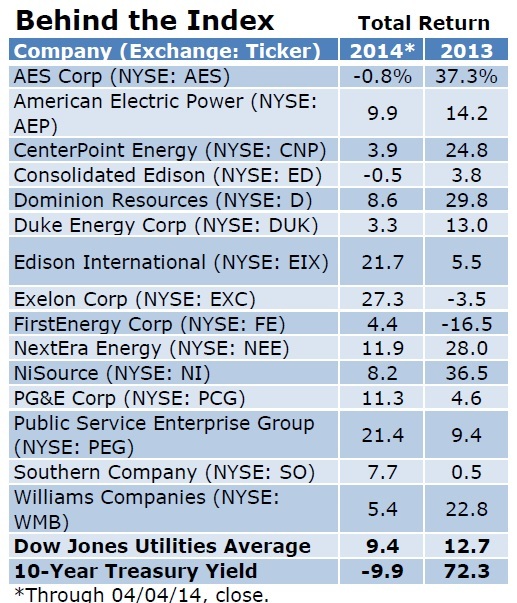 All four stocks have fared well thus far in 2014, with Exelon and Public Service Enterprise leading the Dow Jones Utilities Index. This outperformance reflects the ease with which these names beat the market’s low bar of expectations. However, a meaningful improvement in their business conditions remains elusive. In contrast, safer fare continues to execute and deliver the anticipated goods. What lessons can we draw from this deep dive into the Dow Jones Utilities Average’s individual components? For one, investors are better served by buying the sector’s best bets, as opposed to ProShares Ultra Utilities (NYSE: UPW) and other exchange-traded funds (ETF) that track an index and offer one-stop exposure to a basket of stocks. Since the Dow Jones Utilities Average hit its all-time high on Jan. 8, 2008, several individual components have topped the index’s total return of 24 percent. For example, shares of Dominion Resources have gained almost 92 percent, while NextEra Energy has climbed by 67 percent. Investors who bought an ETF based on the Dow Jones Utilities Average would also have exposure to Exelon and other names that either treaded water or lost ground over this period. Moreover, the increased cyclicality of several stocks in the Dow Jones Utilities Average gives savvy investors ample opportunity for shorter-term trades than in years past. 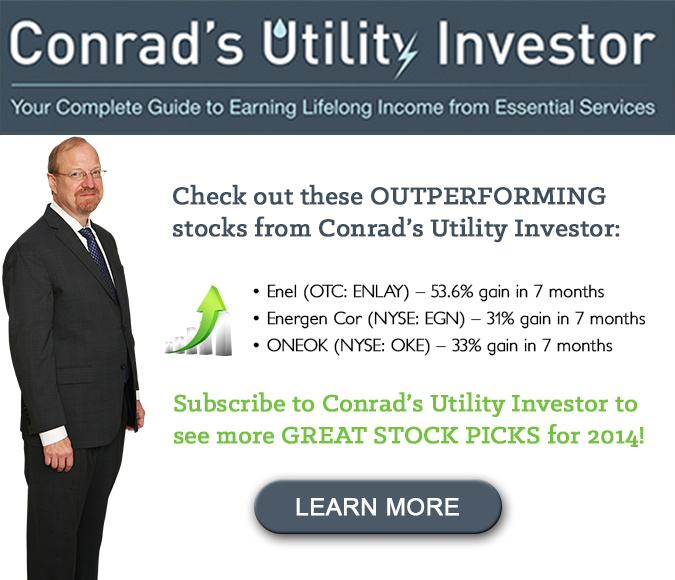 This strategy has already yielded several big winners in my Aggressive Income Portfolio, including Enel (Milan: ENEL, OTC: ENLAY), which had returned 58 percent over an eight-month holding period. This model Portfolio seeks outsized returns by taking calculated risks and is available exclusively to Conrad’s Utility Investor subscribers. My own predilection is to buy and hold high-quality names at favorable prices; this strategy has paid dividends–and then some–for my Conservative Income Portfolio, another model Portfolio in Conrad’s Utility Investor. 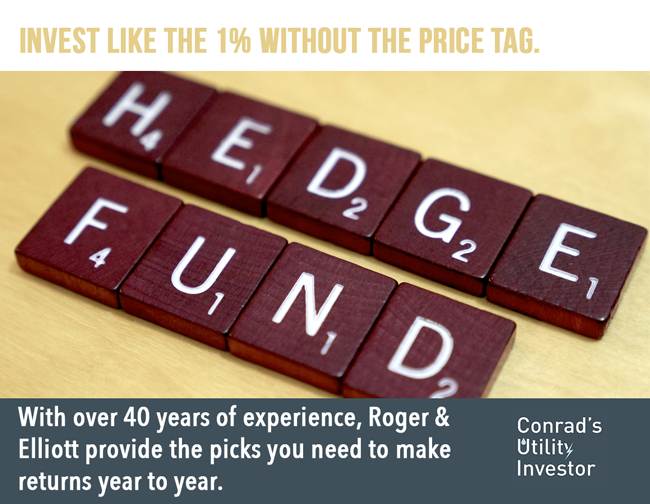 This approach leverages my 27 year of experience covering the utility sector and essential-services stocks, experience that helps me to differentiate true buying opportunities from potential value traps. For example, the selloff that followed FirstEnergy’s dividend cut earlier this year recently gave us an opportunity to pick up New Jersey Resources Corp (NYSE: NJR) at a discount. Federal prosecutors’ recent indictment of PG&E over a 2010 pipeline explosion could give investors a similar opportunity to buy names that the market temporarily deems guilty by association. The same goes for a March 12 explosion at one of Consolidated Edison’s systems in New York City. The most important lesson to draw from the divergent returns posted by members of the Dow Jones Utilities Average: Regardless of whether you prefer to trade regularly or buy and hold for the long haul, you’ll have an Olympian advantage if you take the time to monitor the health and growth of individual companies. The Report Card in Conrad’s Utility Investor gives subscribers my monthly comments and vital statistics on 207 essential-services stocks, including every publicly traded US electric, natural gas and water utility, all major North American communications providers and an assortment of pipeline, utility technology and international names. My proprietary Quality Grades distill a wide range of fundamental and technical data–as well as my deep-dive analysis of quarterly earnings–into a single score that helps you to identify the utilities with safest dividends and best prospects. Don’t settle for average. Investors who do their homework will outperform in this challenging environment for dividend-paying stocks.